U.S. Federal Reserve, Washington D.C. When you get a loan to buy a house or a car, the rate you pay depends in part on the supply of money available. Your loan rate, in turn, may eventually impact the stock market. In certain circumstances, cause and effect are reversed: stock market performance affects your loan rate. Overall, the relationship between loan rates and the stock market is complicated. Usually they are inversely correlated, but at times they rise or fall together. 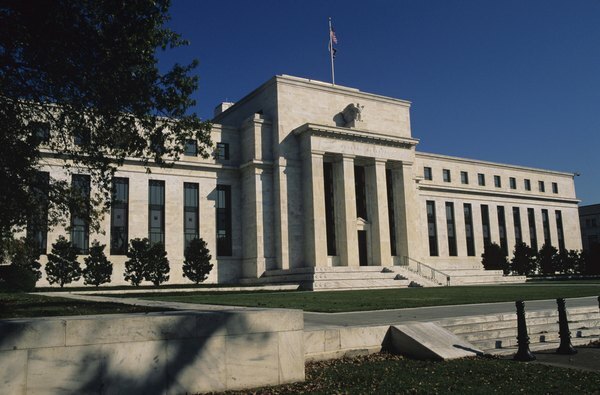 If the Federal Reserve wants to increase commercial loan rates, it sells U.S. government securities to depository institutions and collects the money from the reserve accounts for those institutions -- money that the Fed requires all such institutions to keep in reserve at the Fed. This reduces the supply of money, and the cost of money, reflected in interest rates, generally rises. If the Fed wants to decrease interest rates, it buys Treasuries and pays for them by putting money into depository institutions' reserve accounts. This increases the money supply, and the cost of borrowing generally goes down. Economists note that using the money supply to control U.S. loan rates works best with short-term commercial loan rates. Financial commentators disagree about the effect of the money supply on fixed or variable mortgage loan rates. When commercial loan rates fall, it encourages borrowing for consumer purchases of goods and services, and for business activities. This stimulates the economy in round-robin fashion. For example, consumers buy more cars and dealers have money to expand facilities; contractors who build these new facilities have more money for hiring and for capital investment. As business picks up, stock prices tend to rise. A study by the International Journal of Business and Management of 15 economies found that falling loan rates had an inverse correlation with stock prices for every country studied except Malaysia. There are two very different short-term effects that a rising stock market can have on loan rates. In the first instance, a rising stock market stimulates loan demand and therefore higher rates. In the second, a rising stock market becomes a major component of an overheated economy, and the Fed does what it can to cool it off by tightening the money supply. This has the general effect of increasing commercial loan rates. In both instances, the eventual effect is to stem a rising market trend. Sometimes a decline in business activity has little to do with rising loan rates. Historically, economic activity is broadly cyclical -- periods of expansion are followed by periods of contraction. The cyclical nature of the economy has no single identified cause, although some behavioral economists have theorized that much of it has to do with sentiment in the business, consumer and investor sectors. Fed attempts to mitigate these swings may not be fully successful. If the economy falls into recession, for example, loan rates may fall simply because businesses are reluctant to borrow. In this circumstance, the stock market and loan rates may fall together. Get Rich Slowly: Are Mortgage Rates Tied to the Federal Funds Rate? U.S. News Money: Will Rising Interest Rates Hurt the Stock Market? How Does Mortgage Bond Trading Affect Rates?